Fernando Ruiz under his olive oil brand, FR EVOO, will be present in the Culinary Festival “A 4 Manos” from 17thto 20thMarch 2018 at the Spanish chef Dani García’s restaurant located in the Hotel Puente Romano from Marbella. The event will start with the presentation of his new menu for this season, named “Arcadia” and the presence of more than twenty master chefs to pay homage to one of the Basque New Cuisine parents, Juan Mari Arzak. Fernando Ruiz gets known with the Spanish chef Anselmo Juarez and work together in one of the best worldwide culinary event. Anselmo makes a Gourmet Cuisine based on the Extra Virgin Olive Oil at his restaurant Zeitúm in Úbeda, in the province of Jaén. He’s a highly educated chef who studied in the Catering and Tourism School “Hacienda La Laguna” in the neighboring city, Baeza, and made his internship, what is usually known in the jargon as “stages”, within world-class restaurants such as Celler of Can Roca, from Girona (Three Michelin Stars ***). During 2 years I was working under the instructions of Joan Roca with tasks in all the sectors and taking all kind of charges since I was always the replacement of any managers time off work. Did you also work in the restaurant Tragabuches from Ronda with Dani García? Yes, I was there making stages and checking the performance of the sections. Later, I was in the restaurant Can Jubany from Vic because I was really interested in the Nando’s cuisine, specially in everything related with hunt and truffle dishes. After that, I went to France, to the restaurantLa Maison de la Lozère from Montpellier, where I was the chef during 3 months due to a grant. Most of my memories are about Joan Roca who has taught me to have criterion, to develop an essential feature cuisine. This means that whatever you do there is always a reason for that. The technique, the dish preparation and the ingredients used, etc… Everything is according to a concept, to an idea. With regard to Dani, I can say that he is considered the precursor of the Andalusian Gourmet Cuisine: cold soup, fried foods, gazpacho… An Andalusian Cuisine revolutionary. Anselmo Juárez has made with professionalism and sensibility a family cuisine warm tender from Úbeda. A survival and humble cuisine which has been renovated, refreshed and dignified by this great chef in the early-stages of his career. All of this without altering its essence according to the authorised gastronomic reviewers. 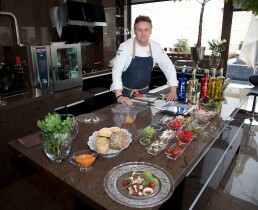 Chef in charge of the Andalusian Gourmet Cuisine renewal. Since ten years ago until today he runs his restaurant ZEITÚM, with the designation Bib Gourmand Awards by the Michelin Guide. A WORLD OF SENSES IN A UNIVERSE OF FLAVOURS. “La Rueda Casa Baja S.L. offers a total guarantee of production, quality, traceability and continuity, with 600 hectares of olive trees and 2 million litres of premium quality extra virgin olive oil. Pure cold-pressed olive juice processed in our mill, controlled by own laboratory and packaging inside our facilities. The whole process made in the same farm in order to ensure the freshness.